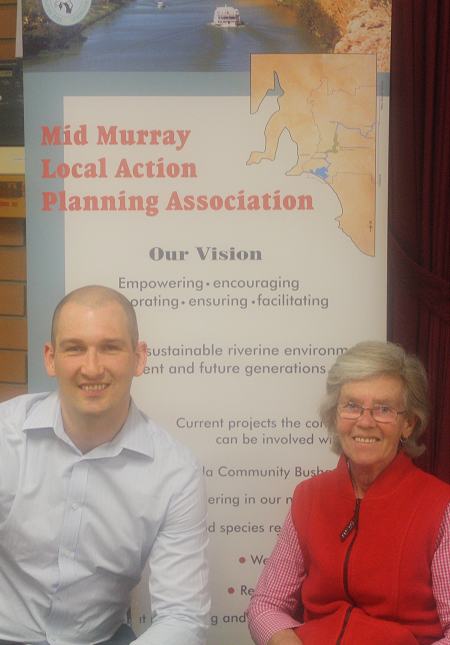 It was a pleasure to provide an address to the AGM of the Mid Murray Local Action Planning Committee in Mannum last night. It was a lovely drive up in the late afternoon sun past some very healthy looking wheat crops, though I learned that sadly the Riverland further north-east was turned upside down by a pretty big storm last night. There were about 20 attendees, mostly local though one guest had driven quite a way to listen which is certainly gratifying. I delivered an updated version of my original presentation from March, which was also delivered to the Local Government Association State Conference. On reflection that will probably be the last time I give that one, and instead retire it as a useful powerpoint reference for others who would like it. It’s pretty long, and I think I have moved on a bit too much. My audiences are probably better served with the shorter versions, and more extensive question time. That’s all good, I learn something everytime. I probably won’t pick up many subscribers as many in the audience were not emailers. That being the case I will send a package of hard copy materials for them to keep on hand, distribute, refer to in future. So it would appear that very little can be taken for granted in terms of what people understand about nuclear power. There was one fairly fiery exchange with the guest who had come from afar, and I am pretty confident she won’t mind me saying that she got on the soapbox, and I in turn got a little pissy! Most of that discussion was about Olympic Dam and the proposed expansion. The “radioactive waste tailings” are less radioactive than they were when they were in the ground as an ore because the uranium has been removed as much as possible. Other matters like water consumption and disposal, waste containment, indigenous concerns, social impacts… these are eternal issues of open cut mining. I am never an apologist for bad practice in the name of nuclear power, but I have not and will not set out to be an expert in every aspect of open cut mining. It’s mining. It has impacts. That you are reading this on a device that uses both copper and gold means you have a degree of acceptance of this, as I do. We had a good chat immediately after question time and found we had a great deal of common ground, such as a shared conviction of the risks of climate tipping points and a surprise agreement that the community of Pt Augusta would be far better served by a nuclear plant that the coal plants. So that’s good. My request to her was to delineate her arguments. It would be quite tragic to allow sound arguments and concerns about mining morph into unsound arguments and concerns about our options for power generation. In trying to improve one situation, we could forever lose the fight on the bigger one. The other issue that came up was the suggestion that I was “naive” regarding my understanding of the management of high level nuclear waste, and that in North America (somewhere) there was a high level waste repository with rusty, bubbling overheated barrels that are needing to be constantly actively managed. It’s the true Holywood image. Can anyone help me there? Is this the case? Where is it and what’s going on? Reality is my friend, I would rather know and understand. Next week, a new original post, stay tuned as always. I think the worst nuclear waste storage that I’ve heard of would be at Sellafield. Mmmm, ok. Thanks. I’ll keep looking. The worst form of storing nuclear waste would be in pools right at the nuclear power plants, where as in Fukushima they cause separate headaches when something goes wrong. Whatever other site is used will always be safer than right at the power plant. Yes I agree with the old designs. I am still none the wiser as to the mechanism by which the horrible sounding situation described was supposed to have occurred. The SMR design I am fond of has on-site waste storage in separate underground containment, which sounds rather good to me. Actually, another relevant point there is that the spent fuel that had finished cooling and proceeded to dry cask storage stored at the Fukushima site withstood the quake and tsunami without incident. Which further begs the question for me, could there really be somewhere in North America where this nightmare scenario is playing out, or was my interlocutor either confused with something else or being vexatious? I still don’t know. Many in SA don’t seem to grasp that coal and gas not only underpins business-as-usual but it makes possible the use of fickle windpower. The OD expansion needs a major increase in energy supply (700 MW) but the fossil fuel base is declining fast even if CO2 wasn’t a problem. I believe that the construction of a large gas fired power plant at Pt Augusta would require guarantees from the Federal government that enough gas would be made available long term from Queensland. The stagnant upper reach of Spencer Gulf is problematic for both water cooled thermal plant at Pt Augusta and desalination at Whyalla. I think SMR powered desalination should be done on open coastline somewhere like Ceduna, still roughly the same distance from OD. That is, cancel both the Pt Augusta gas plant and the Whyalla desal and replace them with an SMR powered facilty at Ceduna. Longer term enlarge that facility so it can replace the water drawn from the Murray now pumped as far as Woomera and Pt Lincoln. I suspect long term residents on the Murray realise the current healthy river flow won’t last. Climatic cycles will eventually bring back restrictions on irrigation. However water diversions like the pipelines at Morgan and Mannum mean people who want to wash their cars get priority. Nuclear power would make the water and energy system less fragile. I quite like that image John, nuclear powered desal at Ceduna, leave the Murray alone. My initial reaction to that is that the net environmental impact for the state woudl be seriously positive. It’s slightly weird that River Murray water is pumped as far as Woomera, only 70 km from Olympic Dam which is on Artesian Basin water. Pt Augusta and population centres to the west should have a regionally independent water supply. Since the pipes are already there it’s just a case of building a big desal and connecting it. I think that your questioner was confusing a number of images to come up with her picture of waste. Certainly this doesn’t apply to any nuclear power waste in North America, but the weapons programs of various countries had dirty sites with a great deal of miscellaneous waste material often in liquid or sludge form. Mayak in Russia might be the worst. Thanks, just read a bit about Mayak and hoooooo-weee… that sounds bloody horrible. In fact the explosion there sounds like a worse outcome that Chernobyl with 200 ARS fatalities apparently. I reckon this might be what he was getting at. Cheers Joffan. Should point out it was a brand new attacker who raised this point, not the lady I discussed in the post, but that was not clear. Jeez, sounds like it was a tough audience Ben. Kudos to you.